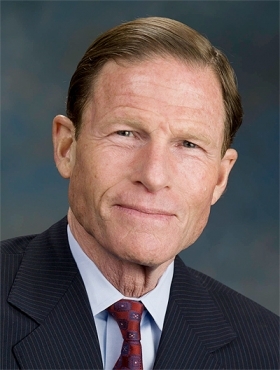 Blumenthal: "The $35 million fine levied on GM is a pittance compared to the company's revenue and the damage caused by its deception and delay." WASHINGTON -- Arguing that U.S. auto safety regulators cannot impose large enough fines to deter companies like General Motors from sitting on safety problems, a trio of U.S. Senate Democrats is proposing that the penalty cap be removed entirely. Congress doubled the maximum fine for auto safety violations to $35 million in 2011 after Toyota’s unintended acceleration crisis, but resisted a White House request to raise the limit to $200 million. In a budget request this year, Transportation Secretary Anthony Foxx requested that the maximum penalty be hiked to $300 million. Sens. Richard Blumenthal, D-Conn., Edward Markey, D-Mass. and Bill Nelson, D-Fla., want to go farther than that. A bill they introduced today would get rid of the $35 million cap -- and it would let the National Highway Traffic Safety Administration fine people who “cause the violation of” auto safety law, even if they themselves do not violate it. The bill arrives a week after NHTSA fined General Motors $35 million, the first use of the new maximum penalty, after the agency concluded that GM moved too slow to recall cars with defective ignition switches. The senators’ bill would also increase the maximum penalty from $5,000 to $25,000 for individual violations of U.S. safety law, such as importing vehicles that do not meet U.S. safety standards or selling a recalled vehicle without doing the necessary repairs. And it would remove the statutory cap on total penalties for a series of violations under that provision of the law. GM has issued 29 recalls in the United States since Jan. 1, affecting 13.8 million vehicles. The company booked a $1.3 billion charge in the first quarter for the cost of the recalls and said that it expects another $400 million charge in the second quarter. Powerful committee leaders in the U.S. House and Senate have not endorsed bills in response to the GM recalls, but reform is seen as likely. Proposals could be bundled into a comprehensive transportation bill -- a top priority for the Obama administration, which says federal funding for highway projects will run out by late summer.